Found one file extension association related to Active-VHDL and 1 file format developed specifically for use with Active-VHDL. 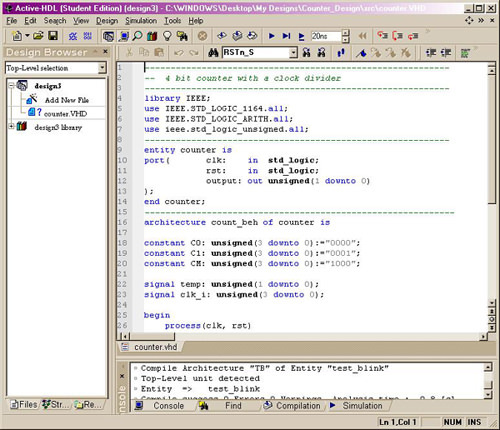 Active-VHDL is a complete IEEE 1076-93 VHDL Simulation design environment using Direct Compile technology. Active-VHDL assists you in all stages of digital design development, from VHDL design entry through behavioral source code debugging, automatic testbench generation, and structural simulation. The product includes an HDL editor, Behavioral Simulator with Vital and SDF support, built-in interface to logic synthesis and FPGA/CPLD place and route tools. The Active-VHDL software seems to be old or discontinued. If you need more information please contact the developers of Active-VHDL (Semiconductor Online), or check out their product website.